“I thought about adults. I wondered if that was true: if they were all really children wrapped in adult bodies…” – Neil Gaiman, from The Ocean at the End of the Lane (2013). The two thirty minute animated episodes, adaptations of Roald Dahl’s Revolting Rhymes (1982) and illustrated by Quentin Blake, formed part of the BBC’s Christmas early evening schedule. This festive presence echoed the fantastical nature of the time of year, a period where storytelling is brimming with excitement. From the religious narratives around which Christmas is founded, to tales emerging from human imagination that fills the skies with St. Nicholas and his trusted reindeers. Fairy tales have a rich and long established heritage in our inclination for storytelling, instilling famous archetypal characters and narratives in our storytelling tradition. While a fitting time of year for Revolting Rhymes to premiere, Lachauer, Schuh, and To’s adaptation is one capable of offering a sense of pure pleasure all the year round, the cheeky retelling of these classic stories possessing an appeal for both young and old alike. For the latter, the playful animation mixed with a deeper penchant of thought creates a complimentary juxtaposition, accentuating the pleasure that the adult audience can extract. The fairytale world of A Land Far, Far Away offers an impression of scale, yet here the world has a decidedly intimate feel, the stories of the characters connected. This is of course a necessity to give the adaptation of six individual rhymes a coherent form onscreen, yet the approach nonetheless offers an alternative, and warmer perspective on the world of these stories. From Little Red Riding Hood’s connection to the tale of the three pigs, to Jack’s connection to the Fairy Godmother, the lives and stories of these characters intersect to create a pleasant warmth. Such a response could be emphasised more prominently as a consequence of the Brexit climate here in the UK, alongside immigration as an internationally divisive topic and divisions stemming from a faulty ideology in land ownership that offers a portrait of a world divided. In the simplicity of this here adaptation, one can perhaps find a tonic for the distasteful reality of our modern world, where an act of unity over division is forged. Beneath any fairy tale is the blueprint of reality, the stories told from the perspective of a storyteller digesting the reality of the everyday. 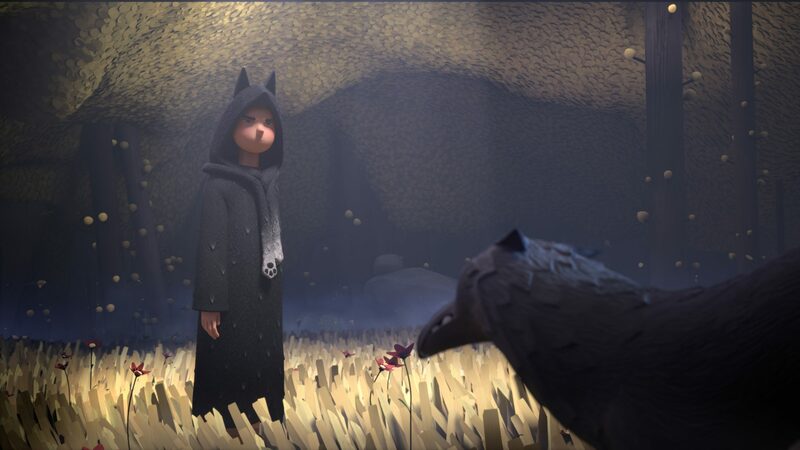 Revolting Rhymes in the tradition of the animated fairy tale is a form of cinematic Impressionism, distorting the reality of somber and natural colours with the bright shades of animation. While the broadcast of Revolting Rhymes coincided with J.A. Bayona’s own meditation on storytelling A Monster Calls (2016), it’s DVD release is preemptive of Bayona’s own interest in looking at the nature of a story. While Revolting Rhymes explores the idea of story as truth, the version we come to know differing from the true account of events, A Monster Calls expands on this to look at the complicated nature of a story, one in which certain determinants such as good and evil are not presented with clarity. The position of the children or the young adolescent in each film addresses the inevitable maturation of our reception of stories with age. It is a progressive journey from stories as simple entities to a propensity to subvert our expectations, while offering in all their complex glory a more insightful understanding of ourselves and our world. 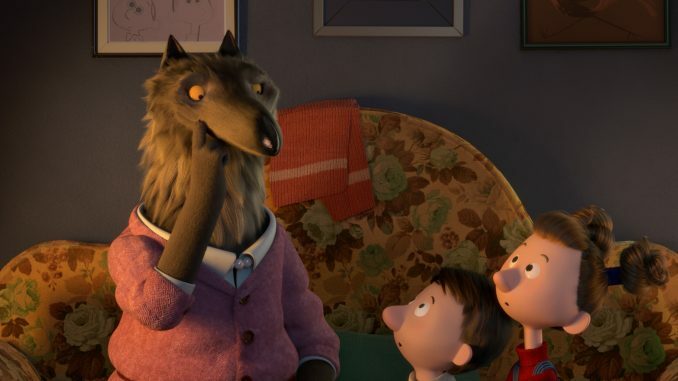 Revolting Rhymes’ focus on the distortion of truth that makes a factual story susceptible to drifting into fiction, is a self-reflective nod to the actions of Dahl, Lachauer and Schuh. Each are a part of a Chinese whisper like chain, retelling six classic tales – Dahl’s cheeky parody in rhyming form, while Lachauer and Schuh rework his six individual poems into an interconnected narrative. It is an act that speaks to narrative as a communal language, one comprised of a limited number of archetypal characters and stories that are recycled. In any consideration of the reason that art can be seen to counter the political and economic borders, the probable answer is this unifying truth that resides at the heart of storytelling. Lachauer and Schuh are attentive to not only retain and echo the lyricism of Dahl’s rhyming verse in the verbal, but instil the animation with a lyricism of its own. Much of the charm of Revolting Rhymes onscreen emerges from its verbal and visual lyricism that instils it with an exuberant enthusiasm, yet one controlled with subtlety and accentuated by the inherent darker moments. The directors show a clear understanding that what we hear must be complimented by what we see if Revolting Rhymes is to successfully make the transition from the page to the screen, and therein capture the spirit of Dahl’s rhymes. Unfortunately, as the inner child stirs, and one senses the eyes widening and ears pricking to absorb every pleasurable moment, we must make do with smaller eyes and ears to see and hear it with. Revolting Rhymes is available to own on DVD in the UK courtesy of Entertainment One.